Editors Note: The story of the Palestinian Refugees is a catastrophe. In 1948 the Jewish population of the British mandate of Palestine agreed to accept the boundary allocated to them in the UN Partition Map. The day after they declared the State of Israel they were attacked by the armies of the surrounding countries . The result was the (unexpected) defeat of these armies and the creation of 700,000 Palestinian refugees. At the same time Jews who had lived in Arab countries for over 2,000 years fled and settled elsewhere. They were given citizenship and built new lives. The Arab League decided that the Palestinian refugees should be used as a weapon against Israel and citizenship in Arab countries should not be offered to them. They persuaded the UN to establish a refugee organisation (UNWRA) to look after them. Today most of them still live in one of the 58 camps operated by UNWRA. Had the Arab countries offered them the same help received by the Jewish exiles there would now be no ‘problem’. The hope is that what has been an area of internal Arab warfare such as that between Iran and Iraq, Saudi Arabia and Yemen a civil war in Syria, an unsuccessful ‘Arab Spring’ and the growth of organisations such as Al Queda, ISIS and Black September will, together with Israel, become an area of peace and tranquility. Today, there are about four million Palestinians living in Palestine, representing 40 percent of the total Palestinian population. Culturally, they are Arabs, speaking the Arab language. The vast majority are Muslim. In addition, there is a small Christian minority. Driving out the Palestinian population, the Jewish armed forces, and later the Israeli army, made no distinction between Muslims and Christians. An exception was the small Druze community in the north of Palestine, which was left in peace. Op-ed: The so-called 'Palestinian refugee problem' would have been resolved if only standard refugees procedures had been implemented instead of UNRWA allowing their number to balloon to 5.3 million by counting descendents too; Obama Admin. buried State Dept. report of actual refugees number, perhaps 30,000. Already in Resolution 302 of the UN General Assembly of December 1949, by which UNRWA was established, it was stated: "A plan must be presented for a time when the welfare program will no longer be needed." The result has been an ongoing distortion that has been going on for nearly 70 years. The US Department of State's announcement, it should be noted, is actually implementing UN resolutions from those years. Not the perpetuation of refugee status, but rather rehabilitation. The initiative to amend the law was that of Dr. Einat Wilf, then a member of the Labor Party. Even then, as now, there was a dispute over the initiative, which had nothing to do with the constant and tiring dispute between "left" and "right." Even then, the top echelon of the defense establishment took a hesitant stance. Amos Gilad, the head of the Defense Ministry's diplomatic bureau, wrote at the time: "Minimizing the refugee problem is a clear Israeli interest. At the same time, UNRWA plays an important role in providing assistance to the Palestinian population... let’s avoid a situation that will endanger the continuation of that aid which is in Israel’s interest." The Israeli position has not changed since then. The so-called "Palestinian refugee problem" would have been resolved if only standard refugees procedures been implemented with the Palestinians as well. The fear by security officials of a vacuum, that would be filled by Hamas, if UNRWA leaves the Gaza Strip, is a little strange, because in any case, in the recent elections for UNRWA institutions, in which nearly 11,500 of the organization's employees voted, the Hamas associated "Professional List" won a crushing victory. Despite all the denials, education at UNRWA institutions primarily produces Hamas activists. Who are these refugees? How many actual refugees from 1948 are alive today? How is it possible that while other refugee populations shrink, the Palestinian refugees only grow? Why do they have their own UN agency separate from the other refugees around the world? A sobering look at the hijacking of humanitarian concepts for political ends. Perhaps the most insurmountable and explosive issue in the Israeli-Palestinian conflict is the so-called “right of return”—the demand that millions of Palestinians must be allowed to “return” to the State of Israel under any peace agreement. While Israel has made clear that it cannot agree to this, since it would effectively destroy Israel as a Jewish state, the Palestinians have steadfastly refused to compromise on the issue. This has made the “right of return” the primary obstacle to any peace agreement. Abbas is by no means alone in this. In fact, whenever it appears that Abbas might waver, the reaction tends to be swift and ferocious. Regardless of Abbas’ statements, the right of return is guaranteed, individually and collectively, through UN resolutions. The refugees will not give up their right no matter where they are living today. Abbas is worried about flooding Israel with five million refugees while Israel has brought one million people from the former Soviet Union and no one complained about this. Our refugees will not accept any alternative to their right to return to their homeland and we do not care what Abbas’ position is. But how many actual refugees are there? Surely over the years, many of those displaced have passed away, and such status does not normally transfer from generation to generation. The issue is so emotive because, in many ways, Palestinian identity itself is embodied in the collective belief in a “right of return” to “Palestine.” Along with the belief that resistance to Israel is permanent and holy, Palestinian identity is largely based on the idea that the Palestinians are, individually and communally, refugees; that they have been made so by Israel; and that the United Nations should support these refugees until they can return to what is now Israel. This belief is passionately safeguarded by the United Nations Relief and Works Agency for Palestine Refugees in the Near East (UNRWA). The organization was established in 1949 following the failure of the Arab war against Israel’s independence, and its original mandate was to provide services to the approximately 650,000 Arabs displaced by the conflict. Today, it is essentially a massive social welfare system serving millions of Palestinians, primarily in the West Bank, Lebanon, Syria, and Jordan. At the same time, its activities go well beyond simple humanitarianism. It plays a distinctly political role in Palestinian society, working to further the cause of Palestinian nationalism through politicized education, activism, anti-Israel propaganda, and other activities. In effect, UNRWA has come to depend on the refugee problem itself. While the refugees benefit from its services, the organization benefits even more from the refugees. They are, of course, the organization’s raison d’être. UNRWA has no incentive whatsoever to resolve the Palestinian refugee problem, since doing so would render it obsolete. As a result, the agency not only perpetuates the refugee problem, but has, in many ways, exacerbated it. In doing so, it has made Israeli-Palestinian peace all but impossible. As a result, the number of official Palestinian refugees—according to UNRWA— has expanded almost to the point of absurdity. 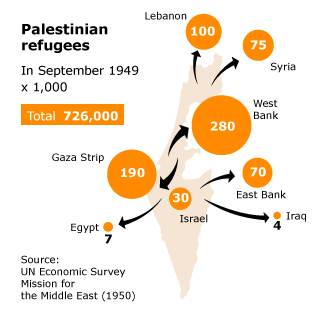 The best estimates are that perhaps 650,000 Palestinians became refugees in 1948-1949; but UNRWA now defines virtually every Palestinian born since that time as a refugee. That number now reaches well into the millions. This is quite simply unprecedented. In no other case has refugee status been expanded to include subsequent generations over a period of decades. UNRWA’s involvement in Palestinian society is equally unique. Its role there has expanded from simple refugee relief to one of the most important and influential Palestinian institutions. In particular, the agency now employs nearly 30,000 people, most of whom are Palestinian. This makes UNRWA the single largest employer in the West Bank and the Gaza Strip, and indispensable to the Palestinian economy. As such, there is a strong economic incentive to keep the prosperous organization afloat. It cannot be said that the agency is ungenerous to its subjects. When the world hears words like “refugees” and “refugee camps,” it instinctively pictures desperate people living in tents or shantytowns. This generates automatic sympathy and financial support for organizations like UNRWA, which regularly receives monetary contributions amounting to millions of dollars. All this is due to the belief that these funds provide humanitarian aid and help with the assimilation of Palestinian refugees. In many cases, the reality is entirely different. UNRWA-administered refugee camps are often fully-functioning suburbs of Palestinian cities, with water, electricity, and even satellite television. UNRWA’s role as a jobs machine and a pillar of the Palestinian economy has led to institutional bloat on a huge scale. Its 30,000 employees, for example, dwarf the approximately 5,000 who work for the UN High Commissioner for Refugees (UNHCR), whose remit is the rest of the entire world. The UNHCR mandate, moreover, is clearly focused on the resettlement and rehabilitation of refugees, not on providing services that maintain the status quo. The role played by economic incentives in these organizations is very telling. While UNHCR—forbidden by its mandate to work with Palestinians—has worked to decrease the number of refugees in the world, UNRWA has worked to increase the number of Palestinian refugees, prolonging and exacerbating the problem rather than solving it. The result of this over-60-year-long process is that incentives for the refugees to resettle in Arab countries or elsewhere are minimal, and practically none exist for UNRWA to end its operations. UNRWA states that the Palestinians are an occupied people, and will remain so until the General Assembly declares an end to the conflict; so as long as the Palestinians are refugees, UNRWA is in business. The minute they are not, it disappears. UNRWA’s flaws have not gone unnoticed, even by members of the organization itself. Indeed, the most important critique to appear in recent years was that of James Lindsay, a former legal advisor and general counsel to the organization. Lindsay worked for UNRWA from 2000-2007 and, after leaving, produced a 2009 monograph for the Washington Institute for Near East Policy that caused a firestorm. Lindsay concluded to much controversy that “the vast majority of UNRWA’s registered refugees have already been ‘resettled’ (or, to use the UN euphemism, ‘reintegrated’),” and that the “only thing preventing citizens from ceasing to be ‘refugees’ is UNRWA’s singular definition of what constitutes a refugee.” Accordingly, Lindsay recommended that UNRWA responsibilities be handed over to Jordan. He acknowledged that legal restrictions on Palestinians being resettled in Syria and Lebanon were difficult, but not impossible to overcome given time and effort. This echoed previous UNRWA responses to similar evidence as far back as the late 1960s. This was certainly an important issue. Unfortunately, UNRWA’s relationship with Palestinian terrorism has been a long one, particularly after the Palestine Liberation Organization (PLO) achieved both international political status and practical authority over the UNRWA refugee camps. Through agreements with the government of Lebanon in 1969 and its eventual UN status as a formal observer, the PLO gained a quasi-governmental role in local and international Palestinian affairs. In his article, “UNRWA and the Palestinian Nation-Building Process,” Jalal al-Husseini wrote that the PLO soon began using UNRWA facilities as terrorist bases. The American government has not ignored this issue. Since the 1970s, a number of Congressional resolutions have sought to limit or cut off funding to UNRWA; and Congress regularly introduces language into appropriations bills requiring UNRWA to promote transparency, self-policing, and accountability with regard to vetting employees for terrorist connections, as well as eliminating the promotion of terrorism in educational materials. Similar provisions are regularly written into United States Agency for International Development budgets—administered by the State Department—in regard to the Palestinian Authority. Humanitarian and charitable institutions throughout Palestine employ personnel regardless of sectarian or political affiliation and offer services on a similar basis. Thus, UNRWA, NGO-run and public hospitals and clinics, for example, employ members of different political groups such as Fatah, the PFLP [Popular Front for the Liberation of Palestine], Hamas, and Islamic Jihad, without reference to their belonging to a specific group. A serious obstacle to effective action on the issue is that Congressional stipulations are regularly circumvented by presidential waiver, in which the president decrees that continuing aid to UNRWA and other Palestinian entities is in the national security interest of the United States, regardless of terrorist connections or structural concerns. But this may no longer be enough. As pointed out in Congressional Research Service Report RS40101, concerns about UNRWA-connected terrorism have increased dramatically since the Hamas takeover of the Gaza Strip in 2007. It seems likely that, with the recent unity agreement between Hamas and Fatah, these concerns will only increase. Indeed, as U.S. funding of Palestinian institutions has escalated in recent decades, American lawmakers have repeatedly questioned members of the executive branch about possible diversion of U.S. funds to terrorism and the presence of terrorists in U.S.-funded entities. As a result, Congress has taken several initiatives to hold UNRWA accountable. In 2009, Congressmen Mark Kirk and Steve Rothman introduced provisions for UNRWA accountability into relevant appropriations bills. They called for transparency and responsibility, and sought to ensure that the monies UNRWA receives do not fund terrorism in any way. This would finally have brought UNRWA funding into compliance with the 1961 Foreign Assistance Act. The bill also underscored the need to evaluate textbooks used in UNRWA schools in order to ascertain that they do not contain “inflammatory and inaccurate information about the United States and the State of Israel, anti-Semitic teaching, as well as the glorification of terrorists.” The amendment died in committee. In the five years since, direct U.S. funding of UNRWA has only increased. This would mean that only those displaced by war could be considered refugees, and the status would no longer be heritable, bringing UNRWA into compliance with the international definition of refugee status. The amendment would also require the Secretary of State to report to Congress about the notoriously slippery number of refugees and the measures being taken to enforce the new definition (this wouldn’t necessarily mean that those accurately classified as refugees would be the only ones eligible for UNRWA services). There is no doubt that, while it would not solve all of UNRWA’s problems, it would be an excellent start. But more than anything else, UNRWA is the institutional foundation of one of the most persistent obstacles to peace in the Middle East. In its relentless defense of its own unique definition of a Palestinian refugee and its complete refusal to reconsider its demand for the “right of return,” it buttresses and perpetuates the Palestinians’ eternal sense of victimhood and the refugees’ narrative. This narrative accepts no responsibility whatsoever for the refugee problem, blaming it entirely on Israel, regardless of the decisions and actions of Palestinians and their leaders. Due to its economic and institutional interests in doing so, UNRWA must continue to maintain and even expand the refugee problem until the refugees’ complete and total repatriation and compensation. This demand for the “right of return” is clear and absolute and has not changed to this day. Over and over again, it has torpedoed any possibility of an agreement between Israel and the Palestinians. It seems clear that the UN erred when it created a UN institution devoted exclusively to one population, with a policy and structure in contradiction to those of all similar institutions. This mistake, however, can be rectified. The simplest solution would be to eliminate UNRWA and immediately subordinate all its agencies to the UN High Council on Refugees. This would be equitable and efficient–but since the prospects of such a decision being effected by the UN are slim to none, it is probably more sensible to look for solutions that can be implemented directly by the United States. Enacting Congressional demands for greater accountability and, especially, bringing UNRWA’s refugee policies into line with those of the rest of the world, would be essential steps toward meaningful reform. At the same time, we must strive to decrease UNRWA’s hold on Palestinian society. The services UNRWA currently provides should be slowly handed over to parallel agencies within the UN, which already provide these services to others, but which have no financial or political interests in perpetuating the problem. In particular, the ultimate goal should be to wean the Palestinians off UNRWA’s largesse completely, and shift the responsibility for providing services and employment to the Palestinian Authority. Doing so would not only be good for the Palestinians, but also for the peace process. It appears that peace cannot be achieved without compromise on the “right of return,” and there can be no such compromise until UNRWA is either substantially reformed or entirely dismantled. The refugee problem was caused by attacks by Jewish forces on Arab villages and towns and by the inhabitants’ fear of such attacks, compounded by expulsions, atrocities, and rumors of atrocities — and by the crucial Israeli Cabinet decision in June 1948 to bar a refugee return. – “Revisiting the Palestinian Exodus of 1948”, Benny Morris in E. L. Rogan and A. Schlaim “The War for Palestine: Rewriting the History of 1948”, pp. 37- 59. Had the Arabs accepted the 1947 UN proposal for a Palestinian state, not a single Palestinian would have become a refugee and an independent Arab state would now exist beside Israel. Instead the Arab rulers chose war causing a mass exodus of Arabs from Israel. WHAT HAPPENED TO THE ARABS THAT WERE LIVING WITHIN ISRAEL’S BORDERS? In the 1948 war many Arab civilians were forced to leave by the Arab nations and the Arab Higher Committee. In 48 and 67 Arab propaganda told of fictional Zionist massacres, this propaganda coupled with proclamations of a swift Arab victory caused thousands of Arabs to flee (with the belief they could return once the Jews had been cleansed). In 1948 there were a tiny number of Arab towns that were evicted for military activity against Israel. Arabs that remained neutral and did not leave were granted full Israeli citizenship. This group now represents 20% of the Israeli population. As many of the Arabs were recent migrants or the children/grandchildren of recent migrants, they simply returned to the neighbouring countries they’d originally came from when they fled. Many Arab villages were systematically depopulated by the Arab Liberation Army (an army of volunteer soldiers from Arab countries sponsored by the Arab League) and local gangs loyal to the Arab Higher Committee (the de facto Palestinian government headed by the Grand Mufti). The empty villages were then transformed into military positions for anti-Jewish attacks. The fellaheen (peasants) who lived in the villages were of little consequence to the ALA and AHC. In one round of peace negotiations the General Secretary of the Arab League (the creators of the ALA), Abdul Rahman Hassan Azzam, declared “I am fighting for a country and villages do not matter” 1. But it was not just peace treaties that were being signed, many of the villages physically repelled ALA/AHC troops and informed the Zionists of ALA/AHC activity. When an armed gang tried to launch an attack against a Zionist kibbutz from the Arab village of Zeita, the villagers not only drove the gang away, but offered to send 100 fighters to protect the kibbutz. Similar scenes were witnessed in Arab villages throughout Israel. One such instance occurred when Abd al-Qadir al-Husayni, the founder of the Holy War Army, was chased from the village of Beit Safafa by an angry mob appalled by the transformation of their village into a centre for anti-Jewish attacks. As time passed and violence escalated some villages folded under pressure and reneged on their peace agreements. While others, like Abu Gosh, remained close allies of Israel throughout the conflict. But what of the cities? If Abdul Rahman Azzam cared not for the villages then one would assume there’d be no evacuation of the cities. In Haifa this was not the case. In 1947 Haifa was a city of two people (71,000 Jews and 70,000 Arabs 3), but by April 1948 the AHC had forced almost all of the Arab population to flee. December 1947 Fearing an oncoming conflict around a third of the city’s Arab residents had fled by December. 12 December 1947 Shabtai Levy, the Jewish mayor of Haifa suggested both the Jewish and Arab leadership offer a joint proclamation urging the city not to slip into violence. The Arabs responded by saying “There is no way we can negotiate with the Jews. Let them take care of their interests and we’ll ensure our security”. March 1948 The AHC ordered the evacuation of the women and children from Haifa as violence escalated between Arabs and Jews. April 1948 The city’s Arab population had dwindled to 35-40,000 – almost half of what it was the previous year. Despite an order for the Arab states to leave Haifa, not every Arab wanted to flee. To ensure their evacuation order was carried out the AHC declared that anyone remaining would be considered a traitor (a crime likely to attract the death sentence if, as was expected, the Arabs recaptured the city). After the Jews had gained control of the town, and in spite of a subsequent food shortage, many would not have responded to the call for a complete evacuation but for the rumours and propaganda spread by the National Committee members remaining in the town. Most widespread was a rumour that Arabs remaining in Haifa would be taken as hostages by [the] Jews in the event of future attacks on other Jewish areas: and an effective piece of propaganda with its implied threat of retribution when the Arabs recapture the town, is that [those] people remaining in Haifa acknowledged tacitly that they believe in the principle of a Jewish State. – British Intelligence Report (Weekly Report No. 3 for Week Ending 28 April 1948, WO 275/79). Haifa was not an isolated incident and thousands and thousands of Arabs were forced to flee their homes. The Arab residents of Tiberias, Jaffa, Jerusalem (several neighbourhoods) and Beisan were just some of the major population centres commanded to leave. In 1948 the world expected a swift victory for the Arab armies. Prior to the War of Independence the Jewish arsenal consisted of rifles, machine-guns and mortars… in contrast the Arab armies possessed planes, tanks, APC’s and IFV’s. The Jewish forces were made up of militiamen (many still physically recovering from the holocaust), while the Arab nations had thousands of soldiers many of whom were highly trained and hardened fighting in military campaigns (like those that sided with Hitler to fight the British and French). The radio stations of the Arab regimes kept repeating to us: ‘Get away from the battle lines. It’s a matter of ten days or two weeks at the most, and we’ll bring you back to Ein-Kerem [near Jerusalem].’ And we said to ourselves, ‘That’s a very long time. What is this? Two weeks? That’s a lot!’ That’s what we thought [then]. And now 50 years have gone by. There were many such testimonies, one of the more striking accounts came from the King of Jordan, whose troops were fighting against the Jews. Even the Palestinian leadership recorded the same account. The Arab armies entered Palestine to protect the Palestinians from the Zionist tyranny but, instead, they abandoned them, forced them to emigrate and to leave their homeland, and threw them into prisons similar to the ghettos in which the Jews used to live. – — Palestinian Authority Prime Minister Mahmoud Abbas, Falastin a-Thaura, (March 1976). This wholesale exodus was due partly to the belief of the Arabs, encouraged by the boastings of an unrealistic Arabic press and the irresponsible utterances of some of the Arab leaders that it could be only a matter of weeks before the Jews were defeated by the armies of the Arab States and the Palestinian Arabs enabled to re-enter and retake possession of their country. While almost every Palestinian expulsion came at the hands of Arabs, there was one isolated instance when a substantial urban population was driven out by Jewish forces. Israeli troops seeking to protect their flanks and relieve the pressure on besieged Jerusalem, forced a portion of the Arab population of the Lydda-Ramle area to a Jordanian occupied position a few miles away. On the 9th of July Lydda was the site of this fierce battle, Yigal Allon described the reason for the battle, “The two towns had served as bases for Arab irregular units, which had frequently attacked Jewish convoys and nearby settlements, effectively barring the main road to Jerusalem to Jewish traffic”.10 After a crushing defeat the town’s mayor Muhammad Ali Kajala negotiated a peace treaty – but was then promptly executed by an Arab militia. Shortly after the residents of the town staged an uprising resulting in a second much bloodier conflict where around 250 Arabs lost their lives.11 In the heat of this conflict Moshe Dayan made the decision to relocate the 50,000-70,000 residents of the Lydda-Ramle region to a Jordanian position a few miles away. Unlike the Arabs who had an official policy of depopulating Arab neighbourhoods, this was not an official Israeli policy and the decision to depopulate Lydda-Ramle was a one off military decision made in the heat battle. After the war of independence the 160,000 12 Arabs remaining in Israel were granted full citizenship. The same was not true for Jews in the Jordanian occupied West Bank who were expelled and their holy places destroyed, nor for Jews in Arab lands who were expelled en masse during the years that followed. Hebrew and Arabic are the official languages of Israel and all road signs, food labels, messages published or posted by the government must also be translated into Literary Arabic. While many of the Palestinians that fled Israel were subject to cruel afflictions and continuous oppression at the hands of the Arab states. 5. Benny Morris, Benny Morris, Birth of the Palestinian Refugee Problem Revisited, p192. 7. The Memoirs of Haled al Azm, Part 1, p386–7. 8. Sefer ha-Palmach, Yigal Allon, quoted in Larry Collins and Dominique Lapierre, O Jerusalem!, (NY: Simon and Schuster, 1972), p. 337; Yigal Allon, My Fathers House, (NY: W.W. Norton and Company, Inc, 1976), p. 192. 9. Israel and the Arabs: The 50 Year Conflict, BBC Television Series, (1998). 10. Benny Morris, The Birth of the Palestinian Refugee Problem Revisited, (MA: Cambridge University Press, 2004), pp. 423–5. 12. Terence Prittie, “Middle East Refugees,” cited in Michael Curtis, et al, The Palestinians, (NJ: Transaction Books, 1975), p. 52. Arab citizens of Israel or Arab population of Israel are Israeli citizens, whose cultural and linguistic heritage or ethnic identity is Arab. The majority of the Arabs in Israel are Muslim but some are Christian or Druze. Many identify as Palestinian and commonly self-designate themselves as Palestinian citizens of Israel. The traditional vernacular of most Arab citizens, irrespective of religion, is the Palestinian dialect of Arabic. Most Arab citizens of Israel are functionally bilingual, their second language being Modern Hebrew. By religious affiliation, most are Muslim, particularly of the Sunni branch of Islam. There is a significant Arab Christian minority from various denominations as well as Druze, among other religious communities. Most of the Arabs living in East Jerusalem and the Golan Heights, occupied by Israel in the Six-Day War of 1967 and later annexed, were offered Israeli citizenship, but most have refused, not wanting to recognize Israel's claim to sovereignty. They became permanent residents instead. They have the right to apply for citizenship, are entitled to municipal services, and have municipal voting rights. Though Israel was envisioned by the founders of Zionism as a home for the Jewish people after two thousand years of statelessness and persecution, that vision also included coexistence with the local non-Jewish populations. Theodor Herzl, the founder of modern Zionism, specifically called for integration and warned against racism in his vision of the Jewish state. Ze’ev Jabotinsky, leader of the more nationalistic stream of Zionism, also advocated integrating the local Arab population as equals. In the years leading up to the creation of Israel, both Jews and Arabs who lived in the area benefitted greatly from the improving economy, social services and overall quality of life. In fact, many Arabs immigrated from surrounding areas in pursuit of these benefits. When Israel was founded in 1948, its Declaration of Independence specifically called on its Arab inhabitants to “participate in the upbuilding of the State on the basis of full and equal citizenship”, and on the neighboring Arab countries to “establish bonds of cooperation and mutual help… for the advancement of the entire Middle East”. Today, non-Jewish citizens of Israel constitute about 25% of the population, with 20% being Arabs. Arab Israelis have equal voting rights and their own political parties, serve on the Israeli Knesset, Cabinet, and Supreme Court; hold diplomatic positions; actively participate in the Israeli music and arts scene; and represent Israel on the national soccer team, including winning the Israeli national championship. They are granted all fundamental civil liberties, including freedoms of religion, speech, and assembly, and in fact enjoy more civil rights than Arabs living in any other Middle Eastern country. Israel is also the only country in the Middle East where Arab homosexuals can live without fear of prosecution, which is why many Palestinian gays have fled for Israel. Many Arab Israelis have spoken out in favor of Israel, and against allegations of an Israeli apartheid. Such claims have also been refuted by many others, including by Richard Goldstone, former Justice of the Constitutional Court of South Africa, who presided over the UN report concerning the 2009 Gaza war. Arab Israelis are generally not required to serve in the military, though some do volunteer. Members of the Druze and Circassian communities are drafted like Jewish citizens, at the request of their own community leaders. Discrimination against Arab citizens of Israel does exist, though on a level comparable to that found in many other Western countries, and certainly far less than the discriminations to which Palestinians living in most Arab countries are subjected. In certain respects, Arab Israelis have more rights than some who live in Europe, such as the rights to wear hijabs. As a general indicator, a recent Harvard study found that 77% of Arab Israelis would rather live in Israel than in any other country. Many Arabs have also stated that they would much rather live in Israel than under Palestinian rule. The Palestinian refugee problem originated as a result of the 1948 Arab-Israeli war, when five Arab armies invaded the State of Israel just hours after it was established. During the ensuing war, as many as 700,000 Palestinian Arabs fled their homes in the newly created state. Many of the Palestinian Arabs who fled did so voluntarily to avoid the ongoing war or at the urging of Arab leaders who promised that all who left would return after a quick Arab victory over the new Jewish state. Other Palestinians were forced to flee by individuals or groups fighting for Israel. Of the Palestinians who left, one-third went to the West Bank (which was under Jordan’s control), one-third went to the Gaza Strip (under Egypt’s control), and the remainder to Jordan, Lebanon and Syria. The Arab nations refused to absorb these Palestinians into their population and they were instead settled into refugee camps. Only Jordan’s King Abdullah agreed to confer citizenship on the 200,000 Palestinian living in Jordan and the Jordan-controlled West Bank and East Jerusalem. In 1949, the United Nations Relief and Works Agency for Palestinian Refugees in the Near East (UNRWA) was created to oversee the economic integration of the refugees into these Arab countries. The Arab governments refused to consider integration, insisting that it would undermine the refugees’ “right” to return to their homes in Palestine. UNRWA continues to operate, providing relief, health care, education and vocational training to the refugee populations in Jordan, Syria, Lebanon, the West Bank and Gaza Strip. A Jewish refugee problem was also created with the establishment of the State of Israel. From 1948-1951 as many as 800,000 Jews were expelled from their native Arab nations or forced to flee as a result of state-sponsored anti-Zionist violence. They left behind their property and the lives they had built in these lands over hundreds of years. As many as 500,000 of these refugees fled from Iraq, Tunisia, Syria, Egypt, Yemen, Algeria, Libya and Morocco and were absorbed into the new State of Israel. Others fled to Europe and North and South America. Tallying the number of individuals considered Palestinian refugees today is a complex matter of intense debate. UNRWA, which registers Palestinian refugees, claims that refugees and their descendants number five million, including: those who left Israel in 1948; those who left the West Bank and Gaza Strip in 1967; those who were abroad but were subsequently not allowed to return to Israel; and all of their descendants. UNRWA’s statistics include those residing in Jordan, Lebanon, Syria, the West Bank and Gaza Strip. It should be noted that UNRWA’s policy of including the children, grandchildren and great-grandchildren of those who left in 1948 and 1967 into the refugee population for demographic and aid purposes is not done for any other refugee group. Israel believes the UNRWA statistics are grossly exaggerated. Israel also strictly distinguishes “refugees” from “displaced persons” and from “expired permit Palestinians” who were abroad at the time the conflicts ensued and were not allowed to return. Palestinian insistence that refugees must have a “right of return” to their former homes inside Israel, and that this “right” is founded in international law, is rejected by Israel. Israel denies that there is any foundation in international law for a Palestinian “right of return,” and that the non-binding international resolutions on the issue call not for a “return” to Israel, but for a just resolution of the refugee problem. Since the start of the Oslo process, refugees is considered one of the “final status” issues, along with borders, security, settlements and Jerusalem, that are to be negotiated as part of a final Israeli-Palestinian agreement. Israel also argues that a “return” is not viable for such a small state, given that the influx of millions of Palestinians into Israel would pose a threat to its national security and upset the country’s demographic makeup. In the decades that the Palestine Liberation Organization (PLO) did not recognize Israel’s right to exist and actively sought to bring about Israel’s downfall and replace it with a Palestinian state, the “right of return” of Palestinian refugees was a rallying cry. In 1993, the PLO recognized Israel's right to exist and committed to a negotiating process to establish an independent Palestinian state alongside the State of Israel. Given this situation, world leaders, including President Bill Clinton, President George W. Bush and President Barack Obama have publicly stated that Palestinian refugees should rightly be resettled in a future Palestinian state. Israel maintains that it is not responsible for the Palestinian refugee problem since it is the result of a war forced on Israel by invading Arab armies. However, Israel has stated that on humanitarian grounds it would participate in an international effort to resolve the situation. Such an effort would likely involve Palestinian refugees settling in a newly established state of Palestine, an international compensation fund, and individual cases of family reunification. Any international effort would also need to consider the situation of the 800,000 Jews who were expelled from their native Arab nations or forced to flee as a result of state-sponsored anti-Jewish violence following the founding of the State of Israel. "We're Jordanians," says her son, Mustapha, a slender, 20-year-old in a bright orange T-shirt emblazoned with meaningless words in unknown languages. "This is the best place in the world," he says, pointing around the bare living room whose worn rugs and threadbare pillows cover the floor on which he and all his siblings sleep. "We would never leave here. But I'm loyal to my country, and I would like to visit it one day. Mohammad al-Derdasawi from Gaza City spends most of his time either hanging out with friends or scouring the Strip for a decent job. It's been five years, and the 26-year-old university graduate has still not found long-term work. "Actually, I've run into very hard times since I graduated from a local university. Believe me, finding a decent job in Gaza has nothing to do with decency." Derdasawi told The New Arab. He lives in the Shuja'iyya neighborhood, in east Gaza, with his parents and other family members. Over the past five years, Derdasawi has been applying for jobs across the Gaza Strip, but all his efforts have proved fruitless. "In Gaza, a young man could either remain jobless for years or take the easiest way; affiliating with a resistance-based [armed] faction," said Derdasawi. "If he decided to join such a faction, he could possibly get killed or harmed by the Israeli army, unfortunately. So, it is the worse of two evils for us, the graduate youth of Gaza," he sighed. The young Gazan has been forced to forget about the idea of a stable married life. "Unfortunately, I can never afford it, unless I have a decent job," said Derdasawi. He had to break off a relationship with a girl he loved because social customs would not allow for them to "remain connected without marriage". Earlier this month, female university graduates rushed to a governmental employment office in an attempt to register for a recently announced job creation programme. "I've have been seeking a job for four years, instead of staying idle at home. I want badly to reach my goals in life," said Najwa Omar, a 24-year-old Islamic Studies graduate, while she applied for the new project. She believes spending time looking for a job, even though very hard to find, is better than doing nothing and falling victim to despair. "You might have heard about recent cases of suicide attempts, by desperate Gaza youth," Omar added. In trying to tackle the unemployment problem in Gaza, where generations of university graduates are rendered jobless, the Hamas-led government in the territory launched a new employment programme, in cooperation with a number of ministries. "This programme can be considered a glimpse of hope for tens of thousands of jobless graduates, even if it is only for a period of three months to one year," said Fedwan Abu Sharee'a, director general of the recruitment department of the government-run chamber of employees. "So far, 35 graduates have registered to fill in only 2,500 various jobs, while the actual number of graduates, seeking jobs, stands at nearly 40,000". The project has been coordinated between the chamber of employees, the ministry of labour, the ministry of finance and the secretariat general of the cabinet. Staffing criteria have been jointy agreed. "The programme is based on employment needs, provided by the various ministries. These needs include archiving, computerising, laboratory work, water desalination plants, pharmacology and the Islamic legal system." Those who are married and have not previously had a job offer will be given top priority, with 500 designated posts for a period of one year and 2,000 others for three-month positions. Successful candidates will receive a monthly salary of around $280, significantly higher than Gaza's average $174 monthly salary. A previous job-creation project was named Jadara, or "potency". How will this be different from past efforts? "For this programme, we have made sure that the registration process will be based on a computerised system that would in turn select candidates on basis of set-forth criteria," said government jobs chief Abu Sharee'a. According to the Palestinian Central Bureau of Statistics, Gaza-based universities produce 16,000 graduates every year. This comes while Gaza has been suffering under a crippling Israeli siege for eight years, and political division from the West Bank. "The construction sector does occasionally function in Gaza," economic analyst Mohsen Abu Ramadan told The New Arab. "Only 27 percent of the reconstruction process of the war-torn Gaza has so far taken place - since the end of the last Israeli war on Gaza in 2014. "This situation cannot change unless the siege is lifted. Also, there needs to be integration of both ends of the Palestinian Authority; Gaza and the West Bank." The outlook for employment prospects, without some form of major intervention, looks bleak for the remainder of the year at least. "There should be some political horizons, such as ending the division between Hamas and Fatah and seeing an end to the Israeli siege," said Abu Ramadan. "These two factors, if secured, then the GNP will notably increase. In addition, there must be deliberate educational planning that would fill in gaps in the market." The Hamas-led authority is hoping to tackle the crisis head-on. "In order to relieve tension among the youth sector, the government is deliberately launching such a programme," said Abu Ramadan. "Yet such a project cannot solve the problem on its own. What is needed is creating a unity Palestinian government." In June 2014, the rival Hamas and Fatah parties agreed on a consensus government and the Hamas-led government in Gaza stepped down. But since then, the consensus government has not taken its seat in the Gaza Strip, while Hamas-appointed public service personnel remained in the various ministries to run routine work. No Hamas-linked ministers remained in charge. Economic conditions in Gaza have worsened, with 43 percent now unemployed. As representatives of both rival Hamas and Fatah, are reported to have met recently in Doha, the people here in Gaza are not optimistic towards reconciliation. REUTERS/Mohammed SalemUnemployed Palestinians crowd in front of the Palestine Islamic Bank in Gaza to receive government aid, Sept. 30, 2007. GAZA CITY, Gaza Strip — In a press conference in Gaza on July 12, Palestinian Labor Minister Mamoun Abu Shahla announced the start of the registration process for the first phase of a short-term employment project: hiring 4,000 university graduates and laborers for positions to last six months. Abu Shahla had announced in May that the ministry's employment program would be funded by the government with 60 million shekels ($23 million) every six months. The government will be looking for additional foreign funds provided by foreign or Arab countries in order to be able to continue with the project in case it ran out of money. The Palestinian Central Bureau of Statistics reported in July 2015 that more than 150,000 university graduates are unemployed in Palestine, where 9,454 men and 9,371 women graduated from college in 2015. Some 2,500 students graduated that year from 29 higher education institutes in Gaza, where job opportunities are sparse. For his part, Aziz al-Madhoun, director general of welfare services at the Social Affairs Ministry, told Al-Monitor that many Gazans provide for their families "benefit from the ministry’s programs and receive aid from the ministry." He said, "Every three months, 14,401 families benefit from the cash assistance program, and 4,749 out of the 70,000 families in Gaza benefit from the UN World Food Programme’s food items such as flour, rice, sugar and other goods.” Coordination between the Social Affairs Ministry and the Labor Ministry will prevent Gazans from benefiting from both programs at once. Yigal Carmon is Founder and President of MEMRI. These days, the Palestinian national movement is descending, before our very eyes, into an internecine struggle over the right to represent the Palestinians – a struggle that is bereft of any political meaning in terms of resolving the conflict with Israel. The octogenarian leader of this movement is completely losing his touch, spewing gutter anti-Semitism blaming the Jews for the Holocaust (see MEMRI Special Dispatch No. 7452, Palestinian Authority President Mahmoud Abbas: Holocaust, Massacres Of European Jews Due To Their Function In Society As Usurers; Hitler Struck A Deal With The Jews, May 2, 2018) and bringing international condemnation upon himself. In 1993 in Oslo, after nearly a century of armed struggle, the PLO, then the representative of the Palestinian national movement, endorsed the political process. But the change was only tactical, for it was unaccompanied by an ideological transformation, without which the political process is a framework void of content. What ideological change would have made the political process a genuine road towards peaceful solution? The answer is simple: the renunciation of the "right of return." IT TOOK 25 YEARS FOR THE TRUTH TO EMERGE, CRYSTAL CLEAR: THE PALESTINIANS ARE NOT READY TO GIVE UP THE "RIGHT OF RETURN." MEMRI's research showed, from the day of its establishment on February 7, 1998, that the Palestinians are unwilling to forgo the "right of return." In fact, it showed much more: the Palestinian duplicity and doublespeak (inciting jihad in Arabic while negotiating with Israel), the PLO's involvement in terror attacks, and Arafat's unwillingness to move from the role of revolutionary to the role of a peace maker and statesman. But the one most important revelation, more important than anything else, was the PLO's insistence on the right of return, which doomed the whole process. In all these years, only one figure in the Palestinian elite agreed to the trade-off: foregoing the right of return in exchange for full Israeli withdrawal to the 1967 borders. That figure was Professor Sari Nusseibeh, who formed a joint movement together with an Israeli counterpart. The movement numbered a few thousand Israelis and a handful of Palestinians. Nusseibeh was ostracized in his own camp and eventually left politics. The Saudi Peace Plan of 2002 could have furnished a basis for a partition-based solution, because in its original version, it did not include the "right of return." However, after the Arab League amended it and grafted the "right of return" onto it, it became a non-starter (see MEMRI TV Clip No. 6031, Former Lebanese President Émile Lahoud Reveals How The Right Of Return Was Forced Into The Saudi Peace Plan In The 2002 Arab Summit (Archival), December 11, 2014 to May 22, 2017; see also Professor Itamar Rabinovich's analysis of that summit, The Warped Saudi Initiative, Haaretz.com, April 7, 2002). During the 25 years since Oslo, the conflict deteriorated further as Israelis of goodwill bought into the Palestinian political process tactic – void of the concrete political requisites for peace. Israel even deluded itself that postponing discussion of the "right of return" would cause the problem to fade away. But the very opposite occurred: the Palestinians interpreted this as tacit acceptance that the "right of return" would eventually be granted, an idea that no Israeli leadership ever entertained. In recent years, by rejecting the proposals by Israeli prime ministers Barak and Olmert for an Israeli withdrawal from nearly all the occupied territories, and by failing, in the past year and a half, to even return to the negotiating table, the Palestinians have brought themselves back to square one: to their situation in 1947. For the Zionist leadership, the test has always been the readiness to accept partition – and it has repeatedly passed this test. For the Palestinian leadership, the test was foregoing the "right of return" – and it has repeatedly failed the test. True, a large portion of the Israeli public was antagonistic to partition, but those representing the majority of Israel's population were prepared to accept it. By clinging to the "right of return," the Palestinians spared Israel the need to go through with this choice, with all its potentially destructive internal repercussions. The Palestinian insistence on the "right of return," and Israel's rejection of it – a rejection shared by nearly all parts of the Israeli political spectrum, from right to left – constitutes the real tragedy of the conflict. The overwhelming majority of Western countries do not expect Israel to agree to the "right of return." The problem of the settlements, which many place in the spotlight, is a problem that could be resolved in a variety of ways, but the insistence on the "right of return" dooms the two-state solution from the outset. The Zionist path to statehood was characterized by readiness for compromise and pragmatism. This was not always the case in Jewish history. In the years 67-135 AD, the Jews believed they could make mincemeat of the Roman legionnaires and send them back to Rome – like Hamas today believes it can send the Jews back from whence they came. But instead, it was the Jews who were packed off to face two millennia of exile and annihilation. This catastrophic outcome was etched deeply into the psyche of most Jews, and induced most of the Zionist leadership to accept nearly any partition out of a "refusal to refuse" mentality. At the time when the British Royal Navy was turning away Jewish refugees and sending them back to die in Europe, Ben Gurion exhorted the Hebrew youth to enlist in the British army that was perpetrating this atrocity. WHERE IS THE PALESTINIAN NATIONAL MOVEMENT HEADED TODAY? Lacking the components vital for a political solution, and unable to persevere even in a sham political process, this movement may revert to armed struggle. For the moment, it has not done so. Even Hamas is endorsing – for now – a strategy of "popular struggle" rather than launching missile attacks on Israel. An alternate scenario is for the Palestinian national movement to seek its future in Jordan. Admittedly, such a solution is not on the horizon. But given Jordan's Palestinian majority, for the long run this demographic imperative cannot be totally dismissed. A third scenario would see the Palestinian public integrate, albeit reluctantly and out of lack of choice, into Israel (the so-called one-state solution) while constantly fighting for all the rights it can get, both civil and national. This scenario is not materializing either. Therefore, the only current development is further descent into decay and political extinction. Given the Palestinian inability to renounce the "right of return," some would ask: Were there ever potential exit points from the conflict? Had King Hussein accepted a peace treaty in return for an Israeli withdrawal immediately after the 1967 war, the "right of return" issue might have faded, gradually but significantly. Had Israel persisted in its principled refusal to recognize the PLO, the standard-bearer of the "right of return," and attempted to reach a gradual solution with a local Palestinian leadership, a more realistic, albeit bloody, process, could have commenced. This could have received significant political backing from Egypt, had Sadat survived. But all this is both hypothetical and moot. As long as the Palestinians fail to make an historical ideological change and forego the "right of return" component of their national identity and struggle, they have no prospect of actualizing any real national goal. One hopes, for the Palestinians' sake, that it will not take them two millennia – as it took the Jews – to accept the need for moderation and pragmatism. 'Abbas's and the PLO's conviction that Israel is a colonialist project that is inexorably doomed will only prolong their suffering.